My previous post showed you what I do to maintain full binding when I start with an untrimmed quilt. Sometimes, I sew on binding for our charity group or for a friend. In those cases, the quilt usually comes to me already trimmed. And most of the time, it is trimmed even with the edge of the top, leaving only 1/4" seam allowance. 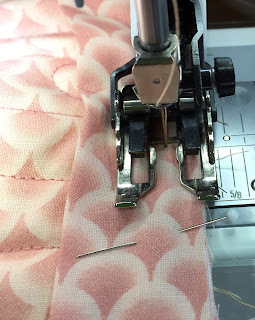 Since most binding is cut at 2-1/2", which gives a 3/8" finished binding, the 1/4" seam WILL NOT fill the binding. There will be a little bit of space with nothing inside. To fix this and still end up with a full binding, I sew a 3/8" seam. Start the first end 3/8" from the edge, and pin the binding even with the edge of the quilt. Sew with a 3/8" seam. I eye 1/8" outside my 1/4"mark on the walking foot because I can't see the 3/8" mark on my sole plate while I'm sewing this seam. When you fold the corners, place the fold even with the edge. 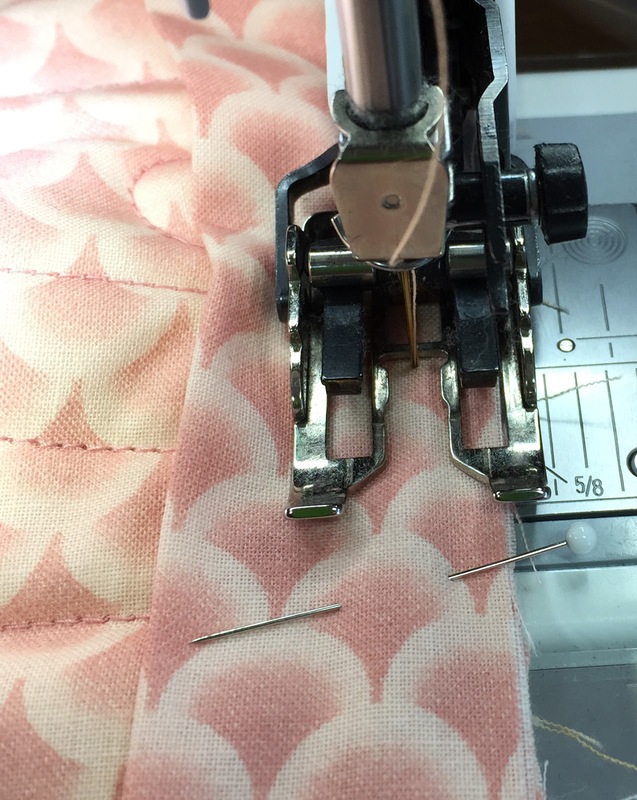 Keep sewing all side, leaving a tail at the end. Sew a corner per my previous post. 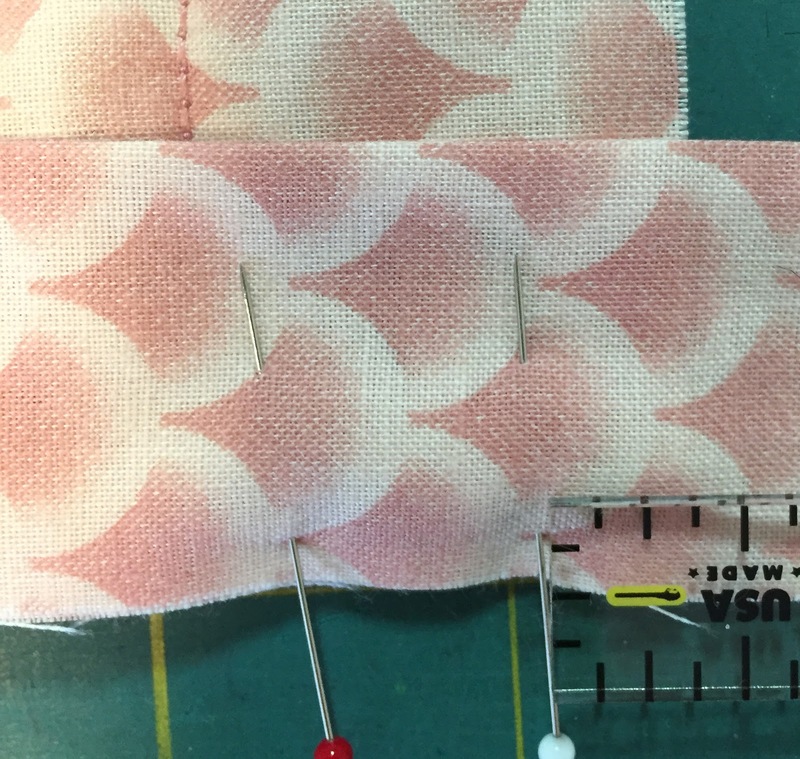 You don't need to trim anything off after you've sewn on the binding. It will be FULL with the 3/8" seam allowance. I hope you use this technique the next time you add binding to a quilt that has been trimmed even with the edge of the top. Yes, you will lose 1/8" of the top, which may end up cutting off the points of some blocks. 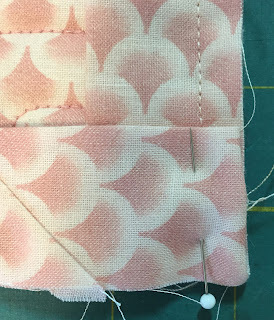 But most of the time, there is a solid piece of border fabric on the outer edges, so it won't affect the look of the quilt at all. May all of your bindings be FULL.